Pat's Scraps: Love Your Pet Day! create a project including your favorite pet. Can you guess what my favorite pet is?! This cute kitty comes from the Cricut Meow Lite cartridge. Oh, and what's that hiding behind my card? It's one of my favorite pets, Smokey. My husband calls him Puff Dog since he's kind of a hefty boy! But he's a real baby--a lovable snuggler and lap cat! 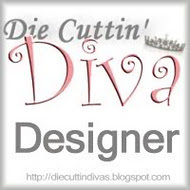 Come join Die Cuttin' Divas in the "favorite pet" challenge this week. Create a card, layout or project incorporating your favorite pet; and be sure to use a die-cut and link your post back to the DCD blog site. I just LOVE this one...adorable!!! LOVE that hanging kitty and the pic of your kitty is sweet as can be! OMG! such a cute cute card Pat. Great picture of Smokey:) TFS and have a good evening. Super cute card, Pat!! I love the picture of Smokey!! !Have a great day. 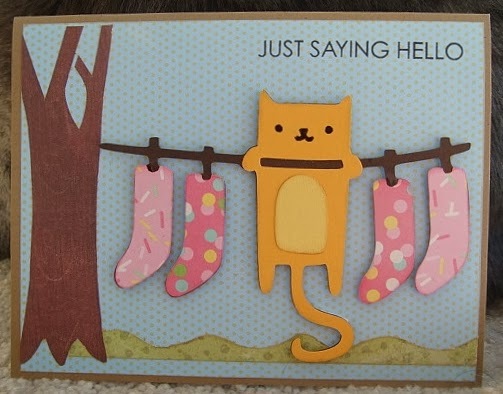 Super cute card design Pat! love the little kitty and the cute scene! Congrat to you on your win over at Courtney Lane Designs-looks like a FUN cartridge you won!! Woot-Woot! DCD Challenge #154-It's Mardi Gras!